In the world, there are many space agencies and each agency promote their space programs and they work under the frame work where they corporate each other for common programs. e.g., as one of schemes, the space networks which consist of earth and relay stations located on the ground or in space are for the tracking and control of satellites for space exploration and earth observations. To operate satellite systems effectively in these space networks, it is required to coordinate spectrums and data interface in advance. 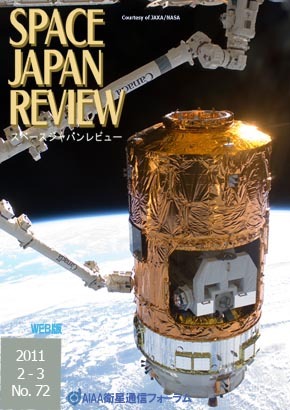 In this review, activities in space agencies are to be introduced and the next review "Discussion on optical communications started in CCSDS" will be continued in the next issue of Space Japan Review. The H-II Transfer Vehicle "KOUNOTORI2" (HTV2) Flight, launched by the H-IIB Launch Vehicle No. 2 (H-IIB F2) on January 22, 2011 from the JAXA Tanegashima Space Center, was successfully berthed to the International Space Station (ISS) on January 28. Peter Warren Singer: "Wired For War-The Robotics Revolution and Conflict in the 21st Century", Penguin Press, 2009. Dr. Akio Iso talks about satellite communication services that are expected to play an important role to bridge over digital divides in rural areas. The 61st International Astronautical Congress (IAC) was held in Prague, Czech Republic between Sep. 27 and Oct. 1, 2010. This paper reports the Conference, featuring the technical symposium on space communications and navigation (SCAN). The technical conference by the IEICE Technical Committee on Satellite Communications was held in 24, 25 February, 2011, with the Space, Aeronautical and Navigational Electronics Committee. They have planned to joint technical conferences in theses years and help both committee members to aggressively communicate each other.